The movie tells a story about a Prince Michael who is due to be married to a girl from a rich family that his parents have picked for him but in actuality wants to marry his own choice who is a girl from a poor home. I can tell straight way that the movie is going to be boring. It starts off that way and continues that way. It is an uninspiring unoriginal below mediocre story about a prince and a pauper *YAWN* Similar to Palace Maid but even more drab. There is nothing new in this movie and nothing to evoke any sort of reaction but yawning. The story is badly executed and a lot of the dialogue is unrealistic. In one scene we see Ugo played by Tonto begging the Prince played by Van to leave Manari his pauper girlfriend. The speech that she delivers to him is over the top and unbelievable. She tells him, “imagine us ruling the world together,” in a bid to convince him to get with her. For a pretty, rich girl it all seems so unnecessarily desperate, especially considering that she seems to barely knows him and we don’t see how their relationship has developed before this scene. In another scene we see Prince Michael confront Ugo’s friend Ngozi to tell her to warn Ugo to steer clear of him as he is “engaged to another.” This scene doesn’t even make sense as he issues this warning just after he has dumped Ugo because he thinks that she accepted money from the palace to stay away from him. Why would he even be in the frame of mind to at that time to talk about being engaged to Ugo whom he believes has just committed the biggest betrayal ever? I said that after her performance in Street President that I wanted to see Collette Nkem Orji again but this was not the vehicle that that was going to allow her star to shine so let me not bother commenting on her performance and hope that next time I see her in something better. Ugezu! Ugezu! Ugezu! OGA I do not know what is happening with you. I have not seen anything good from you since Millennium Lady and Strength to Strength. These were delightful way above average movies that I recommended highly and since then I have seen nothing but a slew of garbage unoriginal “royal” stories. Please pick the projects you choose to work on more carefully. I still have faith that you can make a comeback with works worth raving about. Let 2010 be a much better one. I would not recommend this movie. The sound was echoey on and off throughout the movie. It is the kind of movie that is so uneventful; you will watch and forget what happened in about a week. I stopped half way through part 2. It seemed pointless as it was so predictable and quite a chore to watch. N.F!! what's good sweets? I missed u…. When i first saw the rating, i was like damn! that's pretty low but i trust your judgement and you have one of the best reviews evr. you're always hit it spot on. I won't even bother with the movie cos first of all, god knows how much i hate those cliche stories of the rich guy and the poor girl and the rich princess or whatever…. Hey Fashinga! Long time! I dey ooo! Thank you it was definitely what you would call cliche… no doubt! There are no new stories to tell. Stop being pompous. Everything is a variation of good versus evil. The question is whether or not the telling of the story is enjoyable. In a day when American made movies are "over the top" with sensationalism and "big budget" it was refreshing to see a movie that did not treat as a "spoiled child", catering to me so that I would not use my own imagination. It is not pompous for someone to want something new, however I agree with you there is nothing new under the sun, just novel ways of expressing old idead. Nothing wrong with that. You actually watched this several times? I don't believe you, unless you are an editor on the project it is impossible. We've browsed through your reviews and thought that they are really original and interesting! We would like to invite you to publish your reviews on 7tavern.com, which provides an alternative platform for promising movie reviewers to showcase their talents. Based on the merit of your reviews, we believe that you would be an exceptional addition to our community. P.S I'm sure your reviews is going to add on to the diversity of the blogger community! =D we're hoping to find more movie lovers like you! Yep I have to agree this movie lack originality and was a complete waste of time. I felt part one and 1 and 2 dragged on unnecessarily. I got the message in the first 15 minutes. I still manage to watch part 3 and 4, in which the movie title changes to Dust and Ashes. Lets just say it seemed more exciting. Tonto went crazy, that was the only thing that kept me watching the movie. On the other hand it ended as anyone can predict prince get the wine tapper daughter. Wow 3 and 4??? You dey try ooo… That one would have been too torturous for me! I sincerely appreciate your comment. First is that I am encouraged that you even scored the film 22%. Beyond Conspiracy is not a film. The 'film' was conjured by the marketer. It is only the beginning of the Movie Titled DUST AND ASHES which I did for DCS Entertainment and Magic Movies. There was no reason why they would break the film into two. It is purely a film. 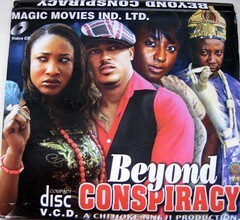 Beyond Conspiracy as they named it did not end and I wonder why anyone would even call it a film. The version that was released in the US is complete and I have received calls from the US. They love the film. Now I want you to get the film DUST AND ASHES. Combine with the one the marketer called Beyond Conspiracy and you will understand that what you watched is only the prelude to the film. I sincerely appreciate your analysis. I have the same problem with DIARY OF A PLAYER, a lovely film, which the marketer divided into two films, calling the prelude- Strength of a Man. These are films that must not be divided. Thanks for coming by UJU. These marketers are bcoming complete criminals… We are seeing one movie with 3 name changes in as many months. I can't even cope any more. I thought this film was too predicable and unoriginal so that even with the continuation the story still continues in the same vein and like Furo said the Prince gets the daughter of the palm wine tapper. As for Strength of man I started watching that, although I never finished although I must confess the performances were much better in that movie than this one. hello Nollywood,im really impressed with all you are doing.as a matter of fact ,my views and percentages automatically matched with yours.this is Collette N.Orji,the one who featured as Ngozi in beyond conspiracy and dust and ashes as well as Yinka in strength of a man and Diary of a player. im glad dearie,and im sure you watched STREET PRESIDENT by Tchidi chikere,better movies will come,better stories and better Production crews,that is what i believe. Thanks for coming by. We are all hoping for improvement. I too believe change is coming. I haven't seen Blue blood or hidden treaure but when I do you will surely see the review here! enjoy the week end with blue blood,wow, did you all get a chance to watch the igbo spoken movie OKE OCHEOCHOR? how is it gooing once again? Hey Collette I'm good. I saw you in 24th July, but your role was too minor for me to comment! Nolly, who was collette in Street president? She was the girl in Mike's exercise class, the one that tried to run off with him at the end of the movie but then got peed off when she realised that he was broke, and then ran back to her ex who refused to let her in the house.